Growing up in Arizona, Becca was always a great athlete. She excelled at soccer, softball, basketball and water-skiing. When high school rolled around, Becca took an interest in football. She tried out for her high school team as a kicker. As a sophomore, she made the junior varsity team. She made 30 of 34 field extra points and all four field goals she attempted. 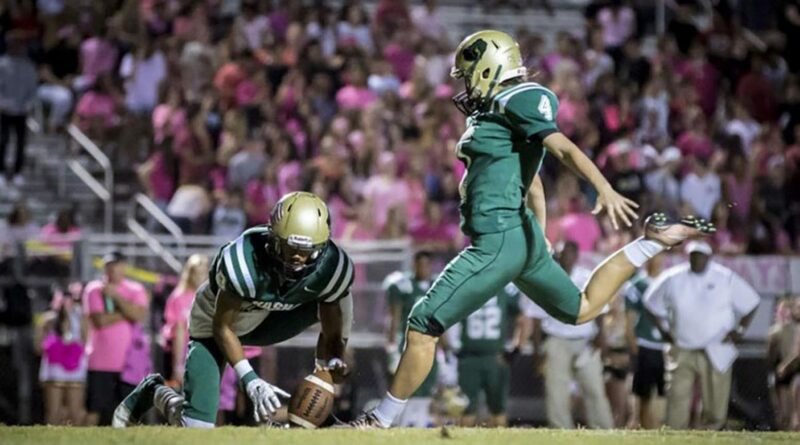 As a senior, she made the varsity team and made 35 of 38 extra points and connected on her one and only field goal attempt. During her senior year, she made a highlight reel of her kicks and sent them to colleges for consideration. Adams State, a Division II college, liked what they saw. They flew her to Colorado for a tryout. Becca nailed it and she was offered a scholarship, becoming the first female to receive a collegiate scholarship to play football. Truth be told, in 2017, she did not earn a starting spot. During her sophomore season she was injured. Becca has two more seasons of eligibility. Will she earn a spot? Will she get into a game and contribute? Not sure, but I, for one, will be rooting for her. Your Turn: What are your thoughts on a girl/woman playing football? I think woman should be able to play whatever they want to. That is because it doesn’t say only males, no it doesn’t so they should be able to play it if they want to. It is a CO-ED sport so everybody should be able to play it as well as I think we should get more females to play football. A girl playing football is a little different but if that’s what they want to do and they are successful at what their doing and doing good enough to earn a scholarship then keep doing it. I think that girls can do anything and deserve to be given equal opportunities to do whatever they love. I agree. If a girl is capable, she should be given the same opportunity. It is up to her to prove herself and make the most of that opportunity. Although I do believe that girls should be given equal opportunities to play the sports they love, I think that girls playing football (especially in college) isn’t the best idea. Kicking is one thing, but the gruesome hits that take place on the field are like no other play in any girls sport. I think it is great because girls should have all the same opportunities as boys. Also if she put her mind to it and wanted to play there should be no reason on why she can’t. I think it’s great. Women should have equal opportunities and if she put as much work in as all of her male competition, then she deserves to get a scholarship. I don’t think sports should be limited to only one gender and this is a big step into the future showing equal rights. I think that women should be able to play football because there shouldn’t be gender divisions in sports, all sports should be available to all. No matter the Gender, race, age if someone can excelle at a certain aspect of a game which is dominated by males. This showed that it’s 2018 baby and that anything is possible now. Sooner than later a female president will be elected. I think that girls should be allowed to play football if the are good enough. If they have the talent to preform at the same level as guys do, there should be no problem with them getting to participate. Girls should be given equal opportunities and this show women can do anything! this shows how hard work can pay off, and also keeps me believing that everyone should have equal opportunities. I think that women deserve equal opportunities, and I’m glad that she got the scholarship. Eja, that’s a nice sentiment, but it’s just not realistic. Boys can run faster and are more powerful. It’s one thing to compete with other females, but competing against males in most sports, is just not a fair contest. When a woman plays in the NBA, NFL or can compete against men in swimming, running… I will change my opinion. I definitely think girls should have the same chance to play football but it is so commonly known as a single male sport. As a rugby player, I do think girls could thrive in football seeing how they play in rugby and this story is a step to getting that opportunity. I think that as a girl, it does seem dangerous , and you can get hurt a lot easier. I do also think if a girl wants to risk it that we should respect it, cause females should feel welcomed. Girls can do anything a boy can honestly , just for football it’s more of a risk . If a girl wants to play football, and has proven that her talent is that of any other player, she should without doubt be able to play. I wonder why we haven’t pondered a women’s football team so that girls like Becca aren’t forced to play with men who are negative and doubting of her abilities.